Heat Fruit'Purée Red Sour Cherry Capfruit to 60°C. Heat to 103°C and leave to cool to 32°C. 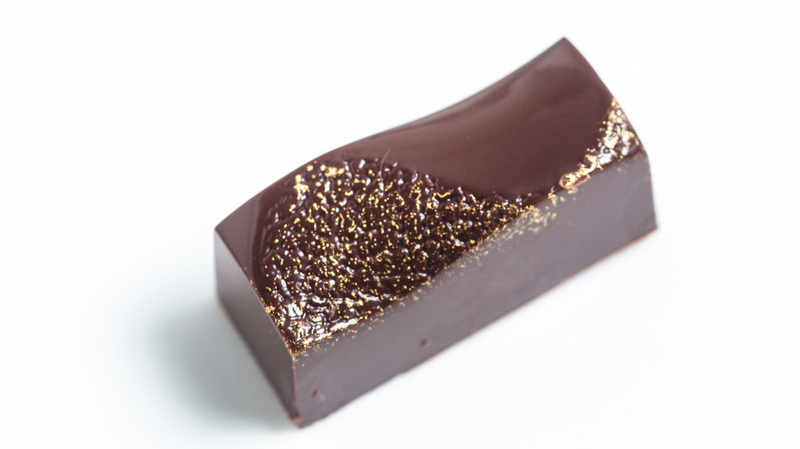 Line moulds with pre-crystallised Cacao Barry® Or Noir™ chocolate and fill up one-fourth with jelly. Mix together cream and tonka beans, and leave to infuse for 24 hours. Make caramel with sugar and glucose syrup. Deglaze with warm cream infusion and leave to cool to 85°C. Add all remaining ingredients and emulsify with hand blender. Pipe layer onto cherry jelly (leave room for praliné). Roast almonds in oven at 170°C and leave to cool. Make dry caramel with sugar, pour onto sheet of baking paper and leave to cool. Grind together almonds, caramel, walnut oil, vanilla seeds and tonka beans into paste with food processor. Do not overheat mixture (max. 50°C). Grind together praliné, cocoa butter and mint in food processor. Pipe onto tonka ganache, filling up shells until just below the rim. Leave to crystallise overnight and decorate.